The infamous book written by Bruce Feirstein, "Real Men Don't Eat Quiche," created a gastronomic boundary over which men with machismo seldom dare to cross. 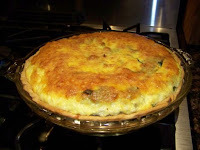 This "Mountain Man" Quiche Lorraine recipe should be an exception to the rule. This quiche can kill you! What real man could pass up a challenge like that? The fat and cholesterol content of a slice of this breakfast pie are right up there with loaded nachos, a chili cheese burger (with fries), or a large meat lovers pizza with extra cheese. That being said, it's also one of the best tasting Quiche Lorraine's you're likely to ever put in your mouth. It has a very light texture and the combination of grated onion and bacon create a wonderfully smokey and savory flavor. Any good dietitian or doctor will tell you that even if you're on a diet, you still need to satiate those cravings for "bad" food every once so often. Moderation is the key. You may certainly substitute lower fat ingredients in this recipe to make it more health conscious, but where is the fun and flavor in that, I ask you? On to the recipe. 2. Mix eggs, white onion, half of the green onion, and spices together well (but do not beat). 3. Add cream and mix again. 4. Spread bacon evenly on the bottom of the pastry shell. 5. Layer cheese over bacon and press down. 6. Pour egg mixture over cheese to fill the shell. 7. Bake for 15 minutes at 400 degrees. 8. Once the top has begun to set, sprinkle with remaining green onion and paprika, to garnish. 9. Reduce temperature to 325 degrees and continue baking for 20-25 minutes, until golden, or a knife inserted into the center comes out clean, or with just cheese clinging. 10. Let cool for at least 15 minutes before cutting and serving. You can also add your favorite herbs such as sage or rosemary to the quiche to create a very different flavor. This dish tastes great cold, or at room temperature, so you can easily prepare it the night before and take it on a picnic or road trip. Enjoy!